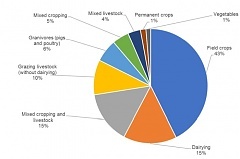 Main results of the Farm Structure Survey 2016 compiled by the Central Statistical Bureau of Latvia show that in 2016, number of medium-sized and large agricultural holdings has increased by 26.8%, in total managing 71.1% of total agricultural area (UAA) or more by 9.5% than in 2013. Statistics Lithuania informs that, based on provisional data, in November 2017, the turnover (VAT excluded) of enterprises engaged in wholesale and retail trade, repair of motor vehicles and motorcycles amounted to EUR 291 million at current prices and, against October 2017, seasonally and calendar adjusted, decreased by 0.4% at constant prices (unadjusted – by 9.7%). Latvia’s innovative clay additive manufacturer Alina has raised a EUR 550,000 investment from business angel syndicate, the company reported LETA. What impact will Nord Stream 2 have on European energy security? Is Nord Stream 2 good or bad for Europe? Is the European Commission right to try to change the EU Gas Directive apparently to halt Nord Stream 2? On 28 November Energy Post held a conference in Brussels, sponsored by Nord Stream 2, and moderated by our EU correspondent Sonja van Renssen, where Gazprom’s pipeline project was debated, reports theenergycollective.com. Several changes regarding support and allowances will take effect in the administrative area of the Ministry of Social Affairs in 2018 - parental benefit and old-age pension would be increased, parents of triplets or higher-order multiples would be paid a special allowance, dental care benefit would be raised, and heads of companies would be entitled to get unemployment insurance benefit in Estonia, reports LETA/BNS. In the first eleven months of 2017, Latvia's hydro power plants generated by 75.2% more electric power than in the same period in 2016, writes LETA, according to the information from the Central Statistical Bureau. The Lithuanian natural gas market next year is likely to see at least three new significant developments, including the emergence of a level-playing field for all gas suppliers after the expiry of a price discount obtained from Russia's gas giant Gazprom, Achema's inroads into the gas trading market and the likelihood of Gazprom supplying gas to some Lithuanian customers through intermediaries, writes BNS FEATURE, cites LETA.